Heritage Cast Iron USA is pleased to announce the introduction of the world’s first modular, ICC code compliant, cast iron stair and balcony railing systems designed and engineered for fall protection. The collection has both 36″ and 42″ tall designs to meet both commercial and residential applications. 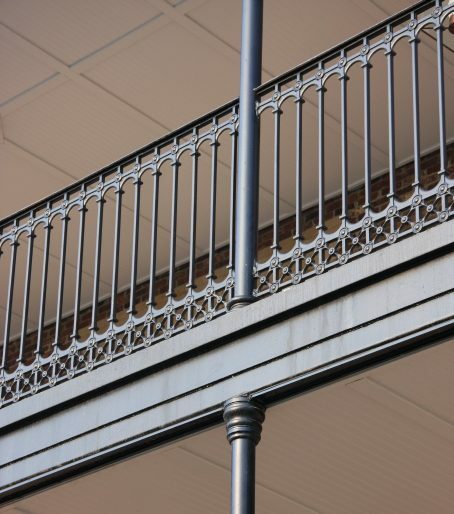 The Walnut Grove Collection of railings has been carefully designed and engineered to meet the ICC standards for fall protection and without any additional materials, once properly installed will pass the 4″ sphere test and load test requirements. These railing designs are well suited for traditional design applications as well as severe service environments such as waterfront, street and utility locations and when purchased in quantity they are extremely cost effective.